Our body breaks down, digest, absorb and assimilate nutrients from food we consume, and is sustained by a metabolic cycle that is occurring throughout within. Enzyme is a vital agent which works as a "catalyzer" to control those transformations and reactions. 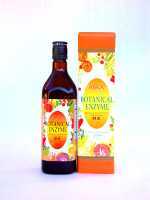 It is defined as "the substance that makes living possible, and it is the light of life" by Dr. Edward Howell who is a pioneer in Enzyme researches. Some doctor even states that the volume of enzyme within ones body dictates his longevity, because Enzyme's wide array of mechanisms thought to improve functions of internal organs. 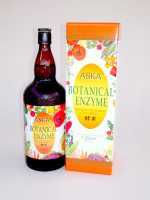 ASKA BOTANICAL ENZYME is the complex nutritional enzyme drink which is made from a mixture of over 60 different plants, which then go through a fermentation process to be diversified and vitalized, making all the necessary nutrients without any oil or fat contents, readily absorbed and digested. It is a living healthy drink. How to drink: Mix the concentration of the Enzyme (1/2 cup -25ml) with water or natural juice. Hot water slows down the functions of the enzyme so it is not recommended for a use. (room temperature is ok to use) It is best absorbed in the morning, before bed at night with empty stomach.